During the summer on Friday evenings, jazz musicians entertain visitors by the reflecting pool at Jazz in the Garden. In the winter, visitors can ice-skate in this wonderful setting. Refreshments are available year-round at the Pavilion Café which is adjacent to the garden. There are six public entrances to the Sculpture Garden. 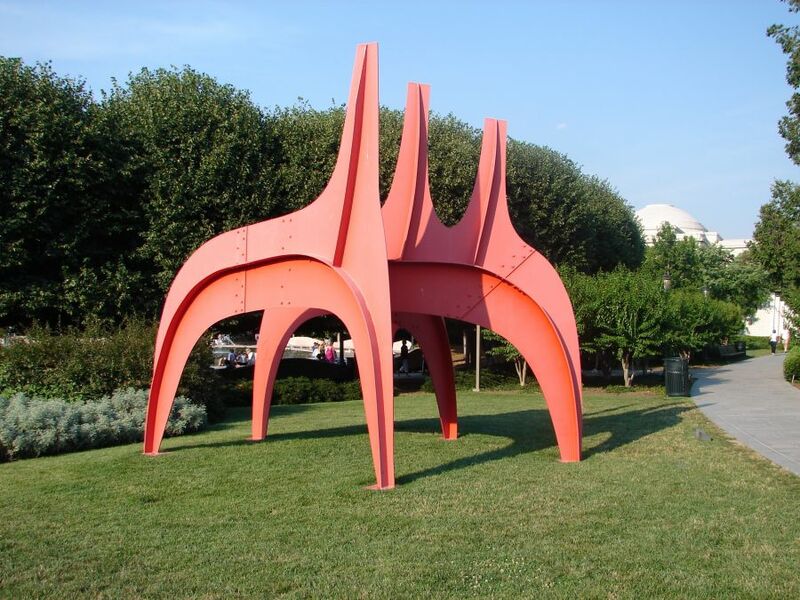 You can access the garden from Constitution Avenue at 9th Street, NW, from 7th Street, NW,(directly across from the Gallery's West Building entrance) or from the National Mall between 7th and 9th Streets NW. The Sculpture Garden is open during regular Gallery hours, Monday through Saturday from 10:00 a.m. to 5:00 p.m. and Sunday from 11:00 a.m. to 6:00 p.m. Sculpture Garden hours are extended until 9 p.m. on Jazz in the Garden evenings. The Gallery is closed on December 25 and January 1. The cafe is open year-round and offers a panoramic view of the Sculpture Garden. The menu includes pizzas, sandwiches, salads, desserts, and beverages. The cafe offers a panoramic view of the Sculpture Garden and a nice place to enjoy a snack or light meal. Hours are Monday–Thursday and Saturday, 10:00 a.m.–6:00 p.m. Friday, 10:00 a.m.–8:30 p.m. (Through October 3) Sunday, 11:00 a.m.–6:00 p.m. The ice rink is open mid-November through mid-March weather permitting. Monday–Thursday, 10:00 a.m.–9:00 p.m. Friday and Saturday, 10:00 a.m.–11:00 p.m. Sunday, 11:00 a.m.–9:00 p.m.
Skating lessons are available for all ages through the Skate with U.S. program designed by the U.S. Figure Skating Association. Snowplow Sam and Mom/Dad & Me: Classes introduce children as young as three to skating while holding a parent’s hand. Children’s Classes: Classes for children who no longer need the assistance of an adult, are comfortable on the ice, and are ready to learn to skate backward and to glide on one foot. Adult Basic Group Lessons: Teens and adults have many opportunities to hone their skating skills with lessons organized according to four levels of experience. Sculpturise and Ice Theater: For skaters inspired by the monuments and sculptures surrounding the rink, the artistry performance class provides a wonderful creative outlet. Hockey: Classes for children and adults.